This is a post to show animations to accompany a poster, which I and my colleague Priscilla Heard presented at ECVP 2016. The poster reported experiments related to the witch ring illusion. The movies below show illusory effects of sideways movement in streaming patterns of dots. This first movie shows how the static track along which a single file of dots are travelling appears to move sideways when the single track is embedded in a fan-shaped pattern of tracks. The eyes in each pair of pictures don’t change at all, and yet in one picture in each pair they seem to look directly at us, whilst in the other they have rotated downwards. (featured: a Sportive Lemur; & a young man by German 16th century sculptor Michel Erhart in the Victoria and Albert Museum, London). The original drawings were done for Wollaston by the leading portrait painter of his day, Sir Thomas Lawrence. They are now in the Royal Society in London, and there’s a movie about them you can watch on Youtube. Here’s another version of the illusion I’ve been working on with my colleague Priscilla Heard. The bright V shaped zones imposed on the faces look like they are expanding or contracting sideways, especially near the sharp end of the Vs at the bottom. 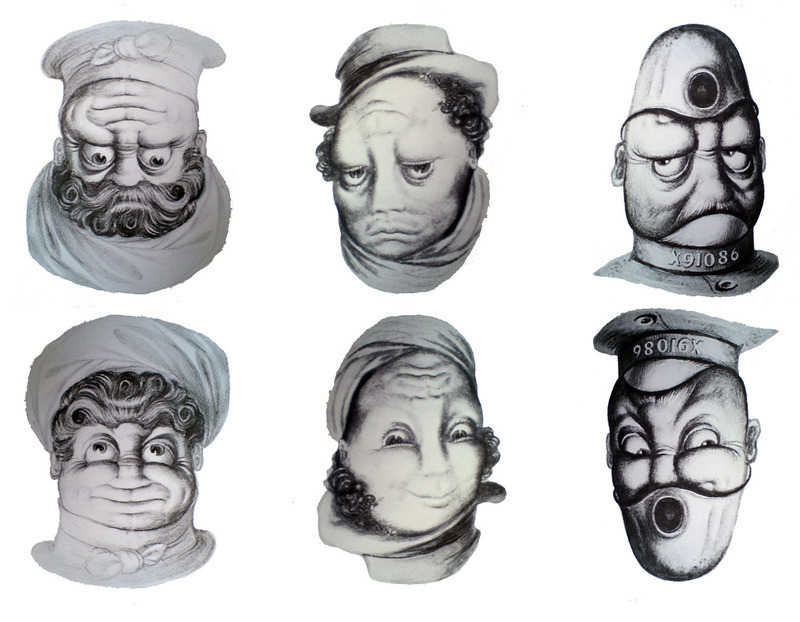 It can be hard to see that it’s an illusion, because the faces really are expanding. But to the right an isolated bright zone shows that objectively the V tracks are quite static. You may still see a bit of illusory lateral expansion even in this isolated set of tracks, but note that the top right corner of the track is quite static in relation to the corner of the movie. It’s a version of the Witch Ring Illusion. I posted about that back in 2011, noting a plan to take a look at it. This year Priscilla and I published a paper about it in the journal Perception. Here’s a copy with slight variations of a stunning new animation of the Ebbinghaus Illusion, by Christopher Blair, Gideon Caplovitz and Ryan E.B. Mruczek. Their version won the Best Illusion of the Year Competition in 2014, a few weeks ago. It’s a brilliant competition whose lead organiser is Susanna Martinez-Conde, and is accumulating a fascinating illusion resource as the ten finalists are added each year. 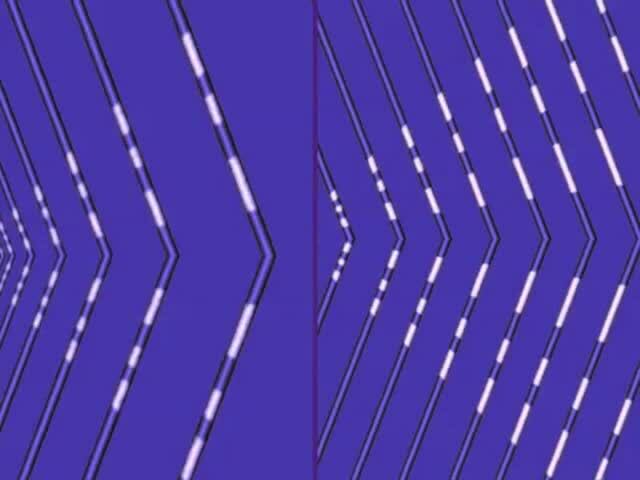 In the movie, as the figure moves up and down the screen, all the circles seem to change size. Yet objectively only the outer ring of circles do so: the central circle remains exactly the same size throughout. It’s so vivid it’s hard to believe, but I’ve just added some yellow rails as a track for the central circle. You can see that the circle always just fits the rails – and they don’t change size. For more info and links on the Ebbinghaus illusion (aka Titchener Circles) see our earlier post on the traditional, static version. Everyone loves a kaleidoscope, particularly the ones with a lens at the end, so that as you look through them whilst sweeping the kaleidoscope around, the view becomes a dazzling starburst pattern. (I find Nova Magic Marble kaleidoscopes are inexpensive ones for kids that work pretty well). 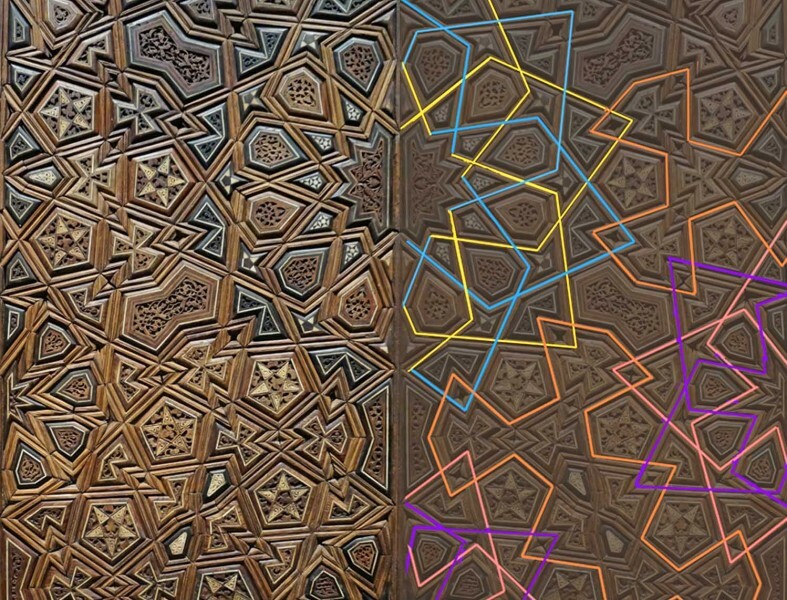 However, real-world kaleidoscopes can only tile the visual field with a limited repertoire of geometric shapes – typically triangles. Digitally we can tile with any shape that will tessellate – that is, fill the plane by repetition without gaps or overlaps. As with real-world kaleidoscopes with a lens at the end, each tile can enclose a streaming segment of a visual scene, if you are handy with graphics and 2D animation packages. If that all sounds a bit puzzling, I think the movie will make it clearer. But then there’s a surprise! Illusions of movement may appear, dependent on figure/ground effects. In 1990 the psychologist and artist Roger Shepard published a cartoon version of this effect, captioned “I stand corrected”, in his book Mindsights (page 91). I wanted to try a photo processed version of it and here’s my second attempt. When I tried before, back in 2008, I somehow couldn’t get my mind round what Shepard had done, and produced an even more twisted version. M.C.Escher’s lithograph Belvedere from 1958 is famous variant on the theme. Subsequent investigators have presented animated 3D versions of it that help explain the effect. 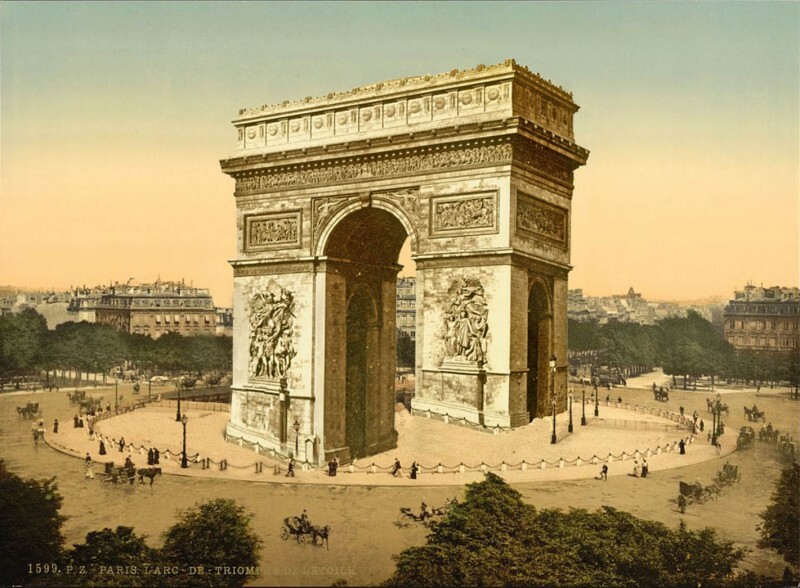 My new version is based on a late nineteenth century Photochrom postcard. They were made by a beautiful process that added colour lithographically to black and white photos. You can see the original in a collection of gorgeous period cards of views from all over the world in the USA Library of Congress. I’m fascinated by the way that spectacular aesthetic effects often seem to involve bamboozling our everyday strategies for making visual sense of the world. This is a beautiful example, a detail of interlace decoration on a 14th century (Western dates) Mamluk Period door in the Louvre from the Al-Maridani mosque in Cairo. (I’ve shown other examples of a role for bamboozled perception in aesthetics in an earlier post, and in the Illusions and Aesthetics category to the right). As you can begin to see in the image, where I’ve combined the interlace pattern on the door with a schematic analysis of its reflection, the interlace we see in the door is a segment of a rosette pattern that repeats across a wider field. But that’s not obvious at all when you just see the door. The artist has not emphasised the lines of the design, but rather the infills – stars and other little geometric tiles. We’re distracted from grasping the overall geometry by all the assertive, enclosed shapes, with their heavy outlines. And the overall shapes that do jump out for me are the beautiful curves that run from top to bottom of the image, which also distract attention from the hexagonal geometry of the pattern. For more analysis of the pattern and the fabrication of the doors, see below, but first, here’s the whole door. When the chevron pattern in the movie is in perspective, so that the bars get thinner and closer together with distance, the bars and the fan of bright bands on them appear to stream past us, as if we were travelling along a tunnel. When the bars are all the same size and equally spaced, so that they don’t show perspective depth cues, the fan of bright bands appears to be expanding. The outer bright bands even look as if they are sliding along the bars. Thanks to Priscilla Heard for the suggestion that the key to the expansion effect is in the absence of perspective cues. If you’d like more on that …. Go back a couple of centuries and there were no chains of shops or malls. In the high street in the UK you would have found the type of shop you were after by looking out for a sign hanging out. There were signs for pharmacists, tobacconists, pawnbrokers, whatever. 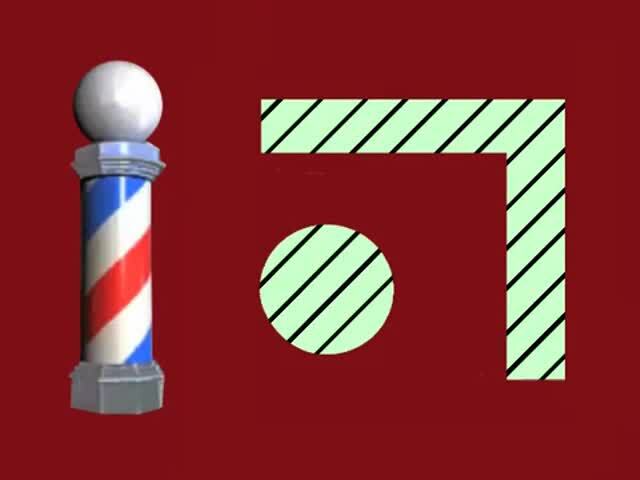 Nowadays there’s just one traditional sign still sometimes to be seen – the barber’s pole, as left in the animation. The barber’s sign shows a famous illusion. The cylinder is rotating horizontally around a vertical axis, but the stripes look as if they are rising – which would be impossible, unless you had some long pole sliding through the cylinder. You can begin to see why in the demo on the right: focus on the vertical slot and the grating seems to be moving vertically (as in the barber’s pole). But focus on the horizontal slot and in a moment the grating may seem to move horizontally. Behind the round hole, for me it tends to look as if moving obliquely. Want to know more about what’s going on? Some of the best of all illusions in the tradition of rotating heads were designed for advertising in the 1930’s by British artist Rex Whistler – you really have to take a second look to convince yourself the lower faces are just rotations of the upper ones. He was sadly killed in action in World War Two, but the heads were collected in a book of 1979, AHA. 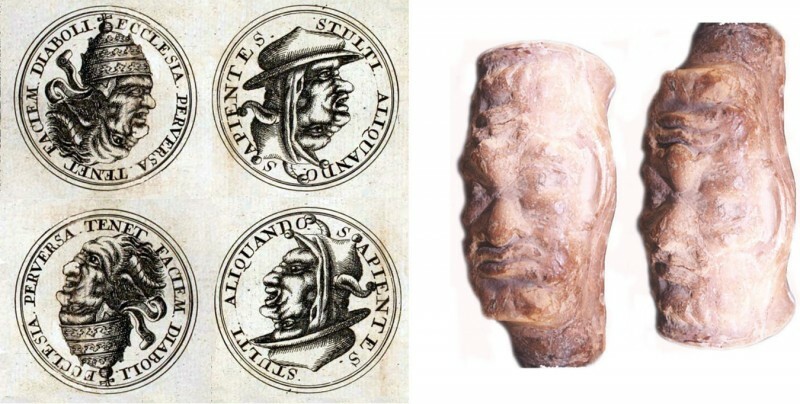 He got the idea from some seventeenth century engravings, (reproduced below), which had first appeared in 1671 in a book by polemicist Pierre Berault. The Western, Christian world at that time was riven with hatred between Catholics and Protestants, and these images are an anti catholic salvo, showing a Pope (left pair of roundels below) and a cardinal (right pair of roundels below) transforming into devils with rotation. I found these details in two editorials about rotating heads for the journal Perception, by perceptual scientist and artist Nick Wade and colleagues. Check them out for lots more info and images. One is from 2003, the other from 2005, and they are the most authoritative source of information on rotating heads generally. There are earlier posts on this site about rotating heads, one with Father Christmas turning into playwright Henrik Ibsen, another about a tale of nightmare in a hotel. And if your appetite for this stuff is insatiable, look at the more recent post on cartoonist Gustave Verbeek.